Member democracy, self-determination, and social justice are enduring AFT values. This is a union established to give voice to our members and advance their occupational, professional and workplace interests and well as values rooted in economic fairness, political democracy, civil rights and individual freedom at home and in the community. Organizing is how we build power to bring fairness and voice to our jobs, and it all starts with member-to-member conversations. Effective organizing means building relationships, one at a time, over time, through structured one-on-one conversations. Organizing conversations are the most effective way to gather information about unit members and the workplace, identify worker concerns and issues, impart factual information about the union, “inoculate” against anti-union campaigns, and move unit members to action. 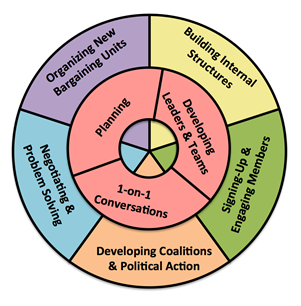 It requires knowing who is at a worksite and making sure you know when you can meet and talk with them; listening to their story and connecting what they are talking about to larger issues in the workplace, the community, or the legislative or political process; and then linking the individual member to others who have the same concerns to get them working together. We believe that any member can become an effective union leader. The fundamental skills are never perfected, but should be practiced and developed over a lifetime. One-on-one conversations are the basis of relationship-building. In a union context, we most commonly think of one-on-ones when asking people to become members, but they are also essential within leadership teams, supporting worksite leaders, and reaching out to community partners. Developing leaders & teams is central to any kind of organizing. We must constantly expand the pool of members sharing in the work and decision-making and also devote energy to making our various leadership teams as healthy and effective as possible. Planning is a way of approaching challenges strategically and is relevant from complex situations like contract campaigns to smaller challenges like a year-end membership party. The component skills of goal-setting, choosing targets, power analysis, and tactics provide a common framework that teams can use to make important decisions together. If you are interested in hearing more about our leadership development program, contact your Field Representative or call our office at 313-393-2200.